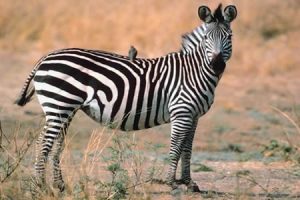 The Plains Zebra, also called ‘Common Zebra’, ‘Burchell’s Zebra’, and ‘Painted Zebra’, is an ungulate and equine from Africa that is native to over 15 African countries. The population of this social species is stable. However, some regional populations, like that in Tanzania, have sharply declined. 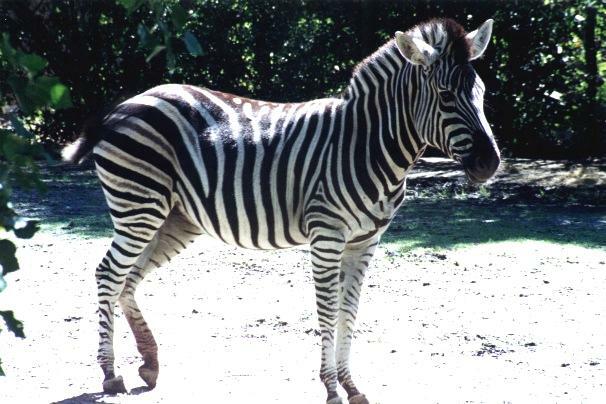 Their beautiful body stripes, patterned with alternating stripes of black and white, have given them a unique look and immense popularity. Size: Head to body length is 217 – 246 cm, while the height at the shoulders is 110 – 145 cm. Weight: They can weigh anything between 175 and 385 kilos. Hair/Coat: They typically possess broad and bold black stripes on a white base. 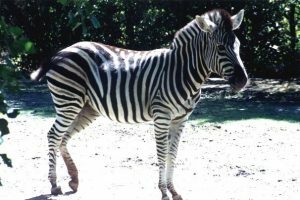 Stripes are vertical on the body, but turn horizontal on the hindquarters, with the northern species having narrower and more defined striping than their southern counterparts that have lesser striped on the legs, the hindquarters and the under parts. 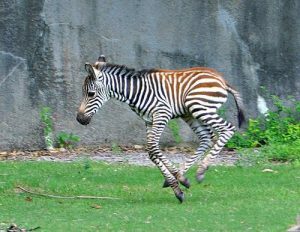 The stripes tend to disappear around the rear and the inner walls of their feet. Short straight manes are present on the neck. Tail: The tail is short, measuring about 47 – 56 cm, ending with a small tuft of black hair (making them different from other equids). The males zebras tend to be a little larger (about 10%) than the females, and also have thicker necks. However, these differences are not necessarily profound. Unlike other zebras, the stripes on the common zebra’s flanks meet on the belly region. The Mountain Zebra and the Grevy’s Zebra lack belly stripes. The stripes of both the Mountain and the Grevy’s zebras are narrower and closer together than the common zebras. The longevity of the plains zebras in the wild is almost 20 years, while in captivity, the life span almost doubles at approximately 40. Plains Zebra’s range is fragmented. 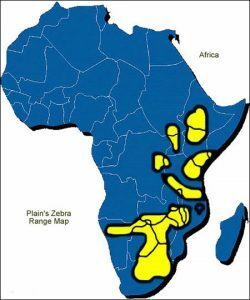 They are widely spread across the savannahs, the grasslands of east Africa, from Sudan to northern regions of Zimbabwe in east Africa down to the southern Ethiopia till Mozambique, Malawi, and Zambia, and most other southern African countries. They are primarily, but not necessarily, found in the treeless grasslands in both tropical and temperate regions. These animals normally avoid permanent wetlands, desert regions, and dense rainforests, and would seldom stray more than 30 kilometers from a water source. 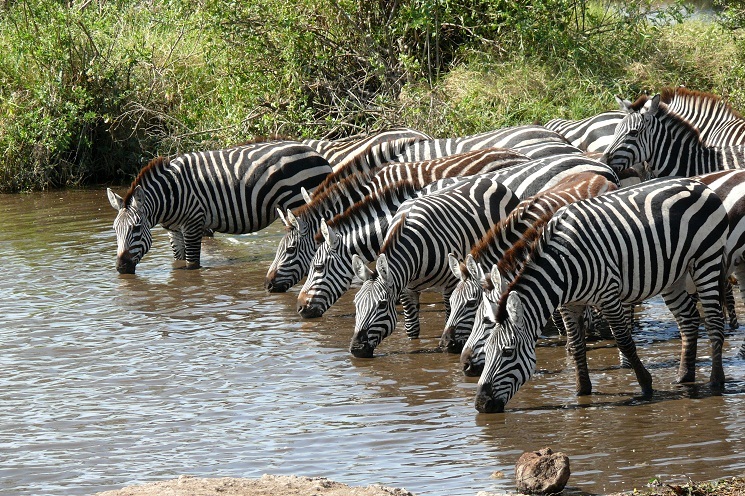 The Zebras are extremely gregarious, living in large groups with a complex social system. This kind of multi-level social organization is unusual with ungulates, and is a characteristic more common to primates, such as baboons. Considering their habitats, this is actually a necessity in order to stay safe from frequent predator attacks. 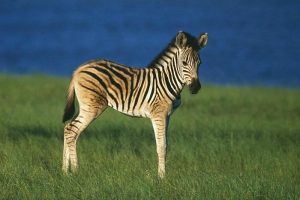 They live in small families with a typical family consisting of a stallion (male), several mares (females), and the juvenile zebras. Known as the ‘harem’, one family can form a group with many other harems, eventually forming a large herd. A stallion will defend his group from other males. When challenged, the stallion issues a warning to the invader by rubbing nose or shoulder with him. If the warning is not heeded, a fight breaks out. Zebra fights often become very violent, with the animals biting at each other’s necks, heads or legs, wrestling to the ground, and occasional kicking. Sometimes a stallion will lie still on the ground as if surrendering, but once the other male lets up, will strike and continue the fight. It is the duty of the leader stallion to defend its own group from other males, which often results in fights. If a male is challenged by another, it would initially display a warning signal by rubbing its nose or shoulders against the attempting invader. If the signal is not heeded, the fight that ensues is often violent, ending in biting each other’s legs, heads, necks, and characteristic kicks, resulting in the defeat of one of them. When attacked by predators, the female zebras would run with the babies, with the males trailing behind for defending them. 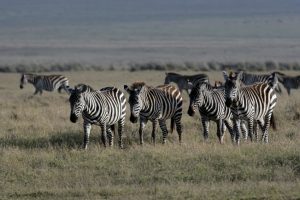 In case one zebra is attacked, the other members of the herd would encircle the predator along with the victim for the purpose of protecting it. Interestingly, these equines strengthen their social bonds by grooming each other. In a harem, the members often scrape and nip along the back, neck, shoulders, using their lips and teeth. The frequency of grooming is the most between the mothers and the foals, followed by the siblings. 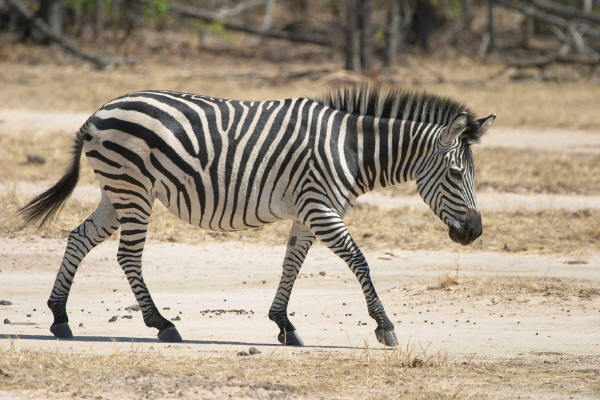 The common zebras are very verbal during communication, with at least six different calls being documented. If they would spot a predator, they emit a bark or a loud whinny in order to alarm the members of its group. If an individual happens to locate a predator, it throws a shrill two-syllable call. Snorts are made mostly during moving together to cover potential dangers or when the males would get hurt. 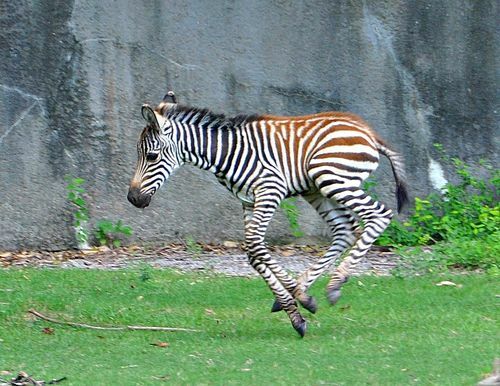 The baby zebras usually wail when they are in distress. Plains zebras polygamous, and breed throughout the year. However, the number of births reaches to the peak during the wet seasons. The mares live in the harem in a form of hierarchy. The alpha female is the first to engaging in mating with the stallion, with the mare added recently to the harem ranking lowest. However, those females that have become weak or unfit might as well drop in rank. When a female meets its first oestrus period (state or period of heightened sexual arousal and activity in non-humans), it advertizes its preparedness for breeding by displaying several body languages including lowering the head, raising the tail, and straddling the legs. It is during this time that all the males in the heard violently compete to own the female. However, once the female would find a perfect match with a successful male, it would never again advertize during the oestrus period. The gestation period of a mare lasts for about 12 to 13 months, with the litter size being 1. A pregnant female would be taken care of by the father itself. After birth, the baby is able to stand on its own feet almost instantly. Usually, the mother would keep other members of the herd away from its infant for the first 2 to 3 days, until the foal learns to recognize its mother by voice, smell and sight. The young ones would start eating grass within a week’s time. The baby zebras are born with brown and white stripes, which gradually start to turn black with age. The young zebras are weaned (freed of dependence on mother’s milk) at 7 to 11 months of age. Foals attain the age of sexual maturity (or puberty) at 16 to 22 months of age, and by the time they are 1-3 years old, both the male and the female juveniles would quit their natal herd. A male young would join a group of bachelors until it is capable of competing with other males by 4 years of age. These young males begin preparing themselves for their adult roles by practicing greeting or challenge rituals, play fights, etc. The Plains zebra spend two-thirds of the day grazing. Their main diet includes variety of grasses (like red oat grass). They would also consume roots, bark, stems, leaves and twigs. 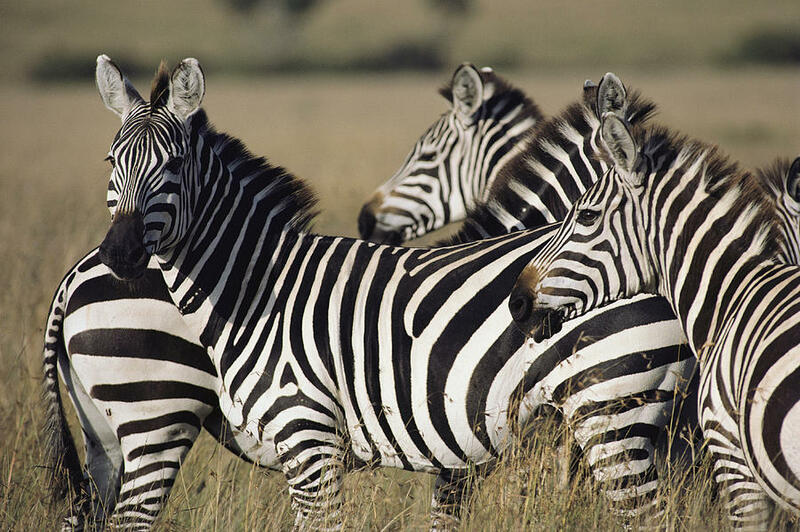 Research revealed that, the diet of these zebras constitutes 92% grass, 5% herbs, and 3% shrubs. 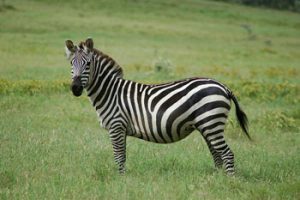 When it comes to zebras, the first physical adaptation that comes to mind is their black and white stripes or patterns. It is thought that, the purpose of these stripes is to provide crypsis, i.e., for providing camouflage by hiding them amidst the environment and the tall grasses or in the shades of alternating sunlight and darkness around their habitat. This also provides a motion camouflage. A visual paradox that prevents the predators from judging the size, distance and direction they are moving. The coat’s color pattern can also successfully function to dissipate about 70% of heat. To cope with the need of the frequent grinding of foods, the back teeth of these mammals continue to grow all through their lives. Zebras sleep standing. This anti-predatory behavior gives them the ability to even remain alert during sleep. These equines have the behavioral adaptation to be able to stay awake when they are not with their groups. Sleeping in groups also allows them to be alerted of forthcoming danger. Zebras have outstanding senses of vision and hearing that help them stay alert and active against approaching predators. These ungulates have a smart ability to pack a powerful strike with their front feet and a strong kick with the back, which, in many cases, give a hard time to big predators, and can even be fatal to smaller ones. Zebras are known to migrate very long distances to find water and food, especially when the dry season arrives. They will travel up to 1800 miles just for food. In short distances, they tend to move in herds during the day to pastures having long grass, while they would return back to the areas with shorter vegetation at night, where their predators have less cover. The primary predators of the plains zebras are the lions and spotted hyenas. Nile crocodiles also pose a big threat especially while crossing the rivers. Wild dogs, cheetahs and leopards are minor predators. The biggest threats of this species presently are habitat loss, which is mainly because of farming, ranching, and the competition for water with the livestock. These animals are also hunted by humans especially for their beautiful skins, but also meat. The Plains Zebras are not endangered. The population of these equines is high and stable. The IUCN 3.1 has categorized them under the LC (‘Least Concerned’) species list. 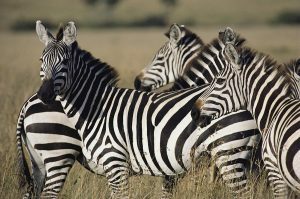 Quite interestingly, common zebras have varying differences in their coat patterns in the sense that, no two zebras are alike. These animals have an excellent sense of taste. They can detect a slight variation in taste or quality of their food. 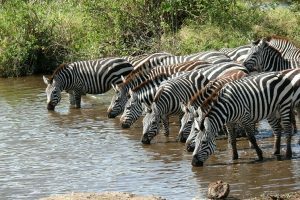 These zebras are highly dependent on water. In British usage, a ‘zebra crossing’ is a street crossing often marked in diagonal black and white stripes, where the pedestrians have the right of way. In some population of the plains zebras, some faint brown shadowy stripes in between the main stripes are also present. Zebras and wildebeests (or, gnus) peacefully coexist, and alert each other in danger. One of the subspecies, known as the ‘Quagga’, is presently extinct. The overall population of the plains zebras number at around 750,000 in the wild.